Marcus Miller V7 4ST (Alder), 4-string bass guitar from Sire in the Marcus Miller V7 series. Hi, being a beginning bass player, please consider this review as mostly suited to beginners like me. 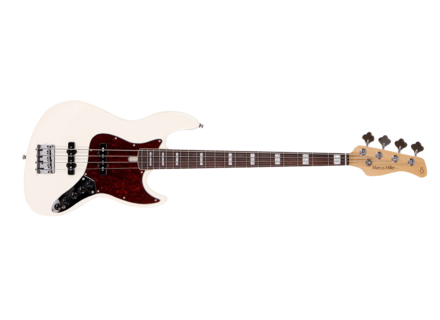 After I bought a used Mexican Fender Jazz Bass, I spent quite a lot of time setting it up and finding the right settings for the way I like to play – which includes all my mistakes. It provided me with an acceptable sound, but I still wasn’t satisfied by it (even after installing a Gotoh string-thru bridge) . For the price I managed to sell it, I bought this alder V7 in two-tone sunburst finish which features a rosewood fretboard. The finish is fine and flawless – and believe me, I’m a rather picky one! Contact with the instrument differs from the MIM Fender JB. This bass is lighter and seems less cumbersome, easier to manipulate, you feel more at ease – at least that’s what I feel. The same goes for the neck once it was set to my taste. The inlays are cleanly and well done, I love how the neck looks. Then, the electronics. I use an Ampeg Micro-CL amp. In passive mode, it sounds a bit like the JB, the sound may seem “softer” but the settings are efficient (good balance between the pickups, efficient tone). However, in active mode, it soon shows how powerful it is, and the settings are even more efficient too especially with the three-band EQ with adjustable mid frequencies – a real asset. Of course, there’s a slight volume difference between the active and passive modes but nothing too disturbing and you easily find the sound you’re after. The bass came with no softcase (in spite of what Sire’s website announced) but with a set of Allen wrenches and a chrome cover for the neck pickup. The guitar wasn’t set properly (buzzy even when playing open strings), but anyway… Also, one of the two included 9V batteries had a broken snap connector – not a real problem though. When I bought it, I had hesitated between this model and an SR300, but I’m definitely attracted to the sound and look of a Jazz Bass.